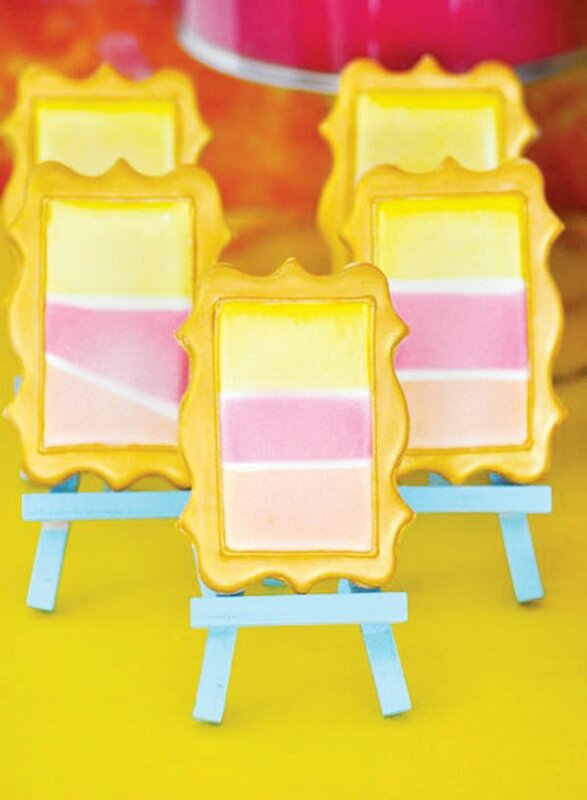 Gold framed paint strip cookies displayed on mini aqua easels! 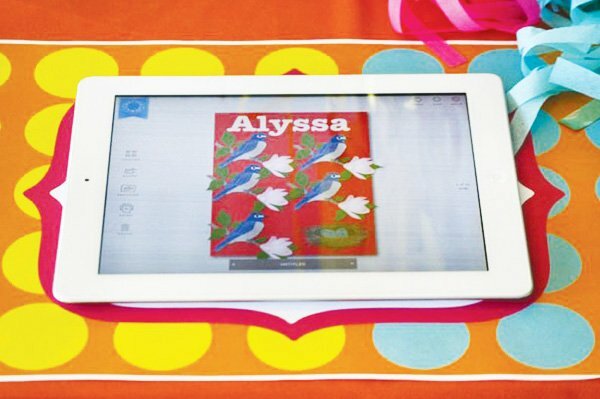 A couple of months back my daughters’ and I had the pleasure of attending a preview party for the new Martha Stewart CraftStudio iPad App. I was totally inspired and wanted to design some of my own party elements using the app. I also wanted to host an art/craft party that was out of the “norm.” Color blocking is huge right now, so I thought why not color block the party?! To step it up even more, I decided to mix and match my patterns. It’s a little risky but totally worth it when it works! 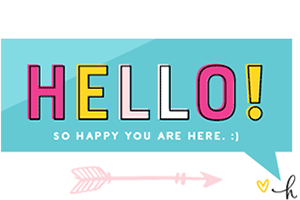 I stuck with 4 main colors (Aqua, Pink, Yellow, and Orange), and 3 main patterns (Chevron, Polka-Dot, and Stripes). I rented pre-school sized chairs and tables so that the children were comfortable. I used different craft supplies from Martha Stewart Crafts Dept and 36 in. round balloons from The TomKat Studio that were tied off with fun balloon tassel from The Flair Exchange to line the tables. One of my favorite parts of the party were the adorable custom made mini smocks from Sook Ee Designs that were used as chair covers! My children had tons of fun prepping for the party. They painted the Mason Jars to use as vessels for our paint brushes with the Martha Stewart Paints that were sent to us the week before. 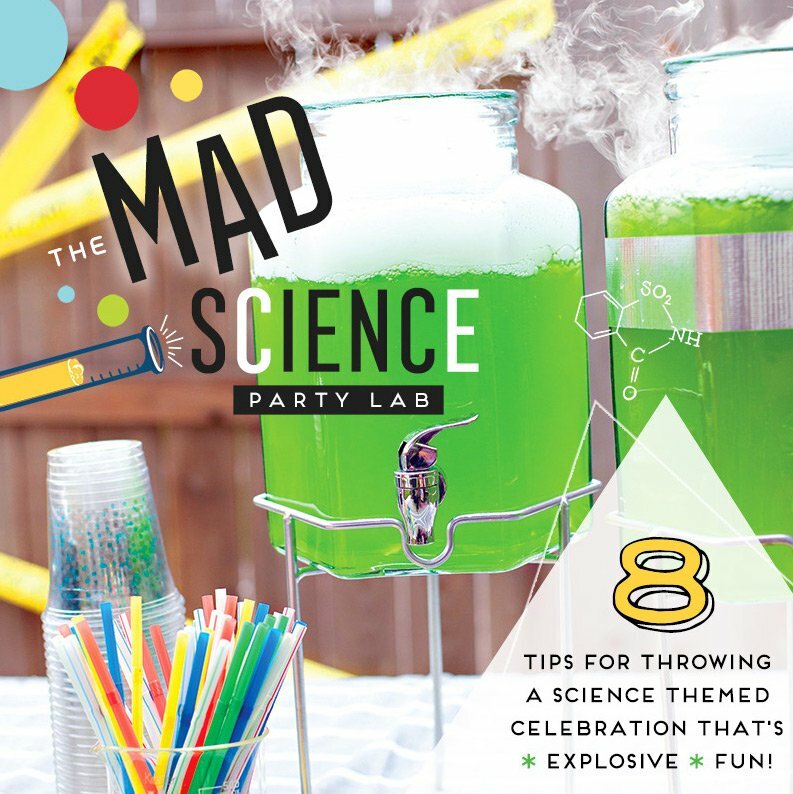 They also put on gloves and picked out all of the Green Sixlets from our “color blocked” Sixlet candy bags and placed the matching ones in Push Pops from Garnish. 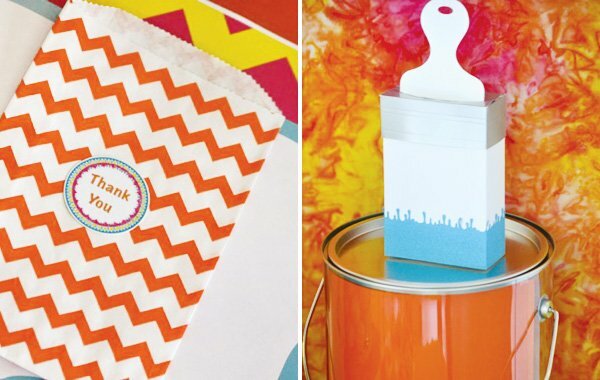 Colored scrap booking paper was cut and inserted into clear paint cans from Michaels to act as “paint”. There were two stations at the party. One was a “supervised” station where the kids got to have fun with the iPads and design their own keepsakes using the CraftStudio app. 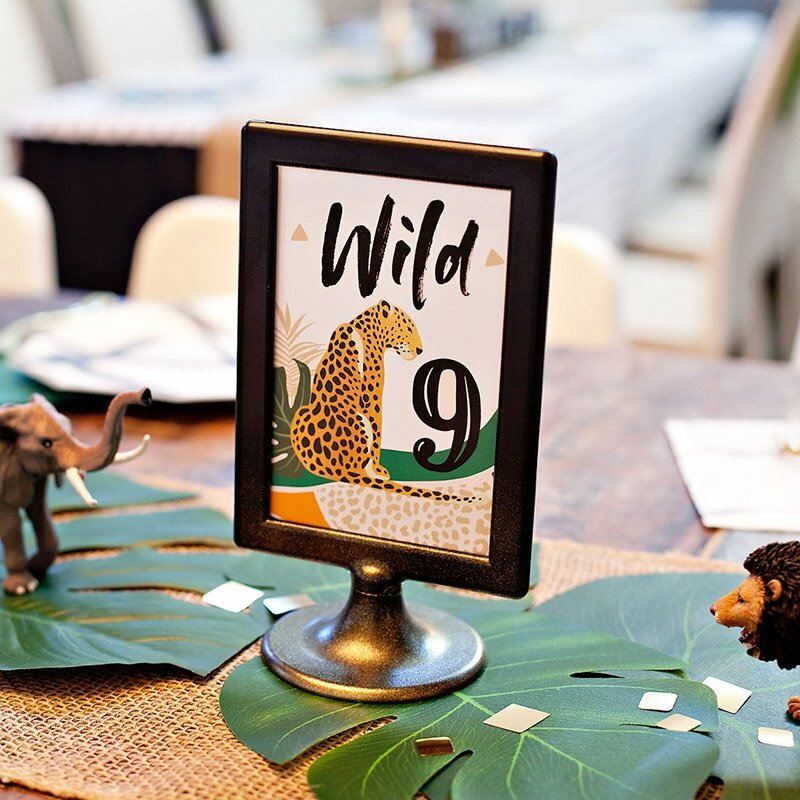 The other was the arts/crafts station where they got to put on their custom made smocks and paint their own mini canvas that were on framed paper place mats designed by Bonito Design. The kids had an amazing time painting! 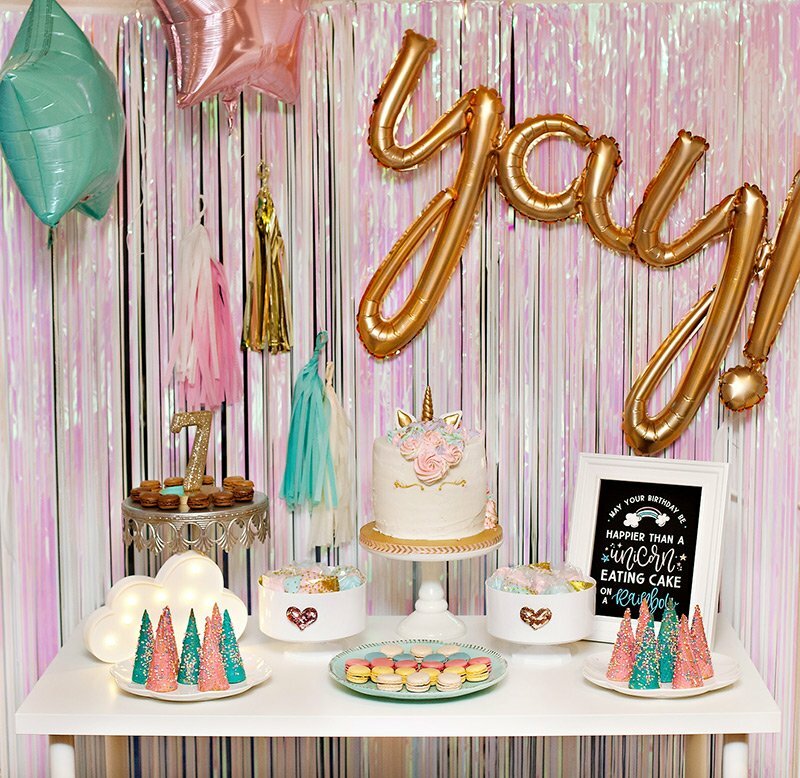 The dessert table was SO much fun to design! I always start with the backdrop when I style dessert tables. I was thrilled to find the perfect watercolor fabric from Joann’s. I lined the fabric backdrop and table with fun tassel from The Flair Exchange . 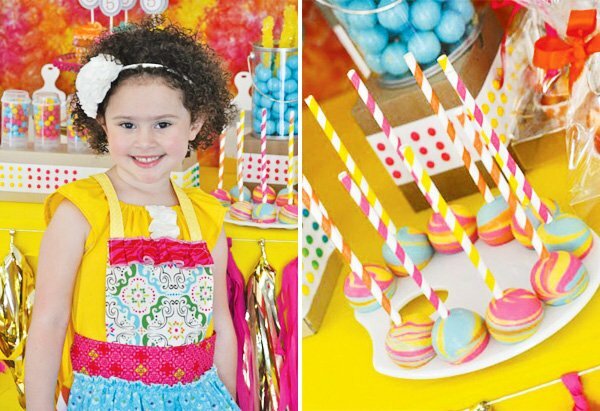 I asked Lerida of NY Cake Pops to make “swirled color blocked” cake pops that I topped off with striped party straws to be placed on an art pallet. Sweeties by Kim made the prettiest “glittered” chocolate covered Oreo’s I’ve ever seen! My sweet friend Callye of The Sweet Adventures of Sugar Belle made artistic framed “paint strip” cookies that were placed on Aqua painted easels. I used Cello Gusset bags with inserts to hold mini cherry filled cups as a healthy take home snack. The “paintbrushes” from Crafts by Rosa were used not only as props, but favor boxes as well! 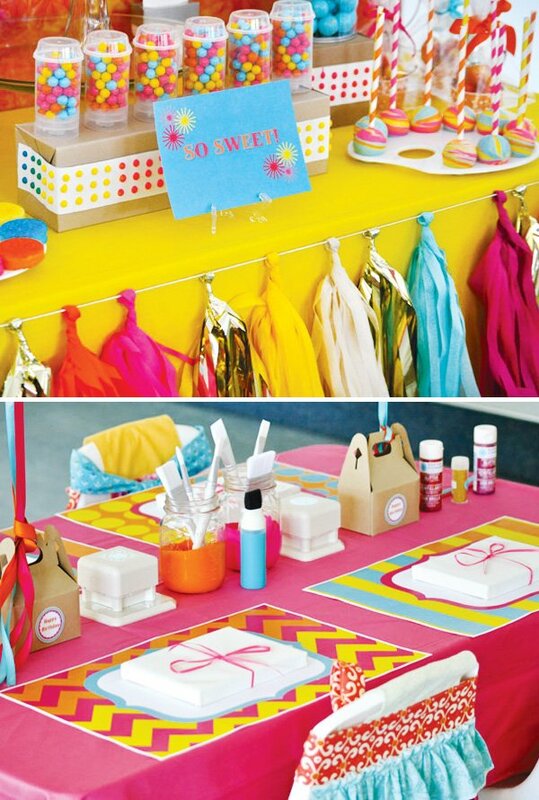 *This Color Blocked Art/Craft party was totally out of my comfort zone, and I’m so happy that everyone I worked with trusted me, because if it weren’t for them I wouldn’t have been able to pull it off! 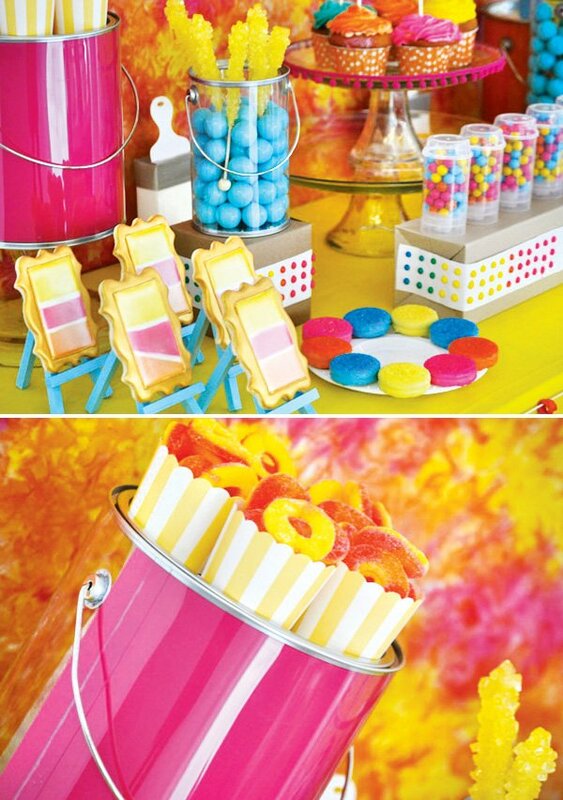 ADORE this party and all the bright, fun colors! Those little cookies on the easels are fantastic! LOVE it all! Fabulous!! 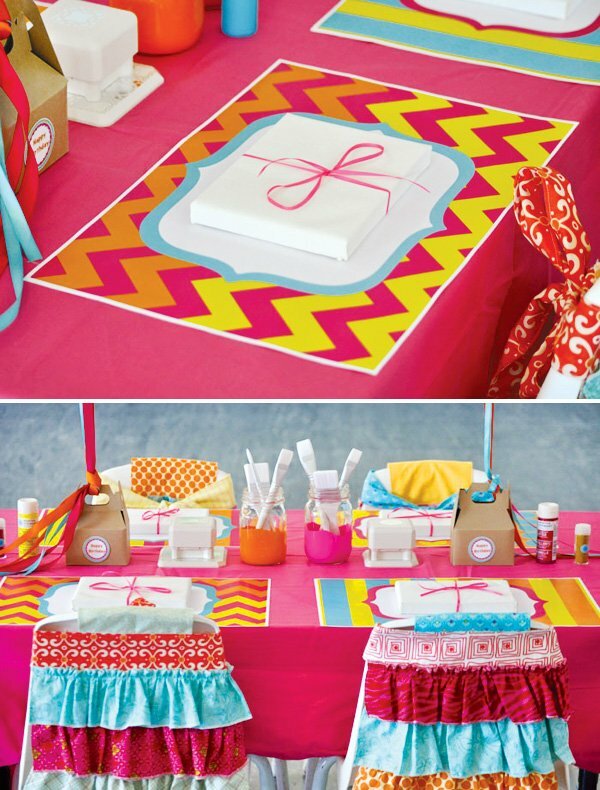 My favorites are the paint strip cookies and the aprons!! Love the colors, too!! Love it! 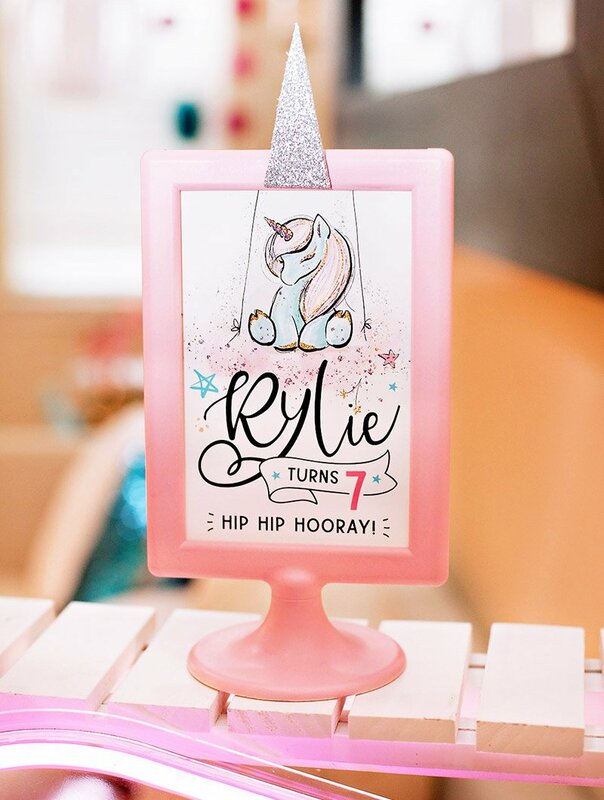 Thanks, Jenn & the HWTM team for the fab feature! Kiomary Sotillo, did you see Aly's ipad art? So cute! Spectacular party! Love the painted mason jars. 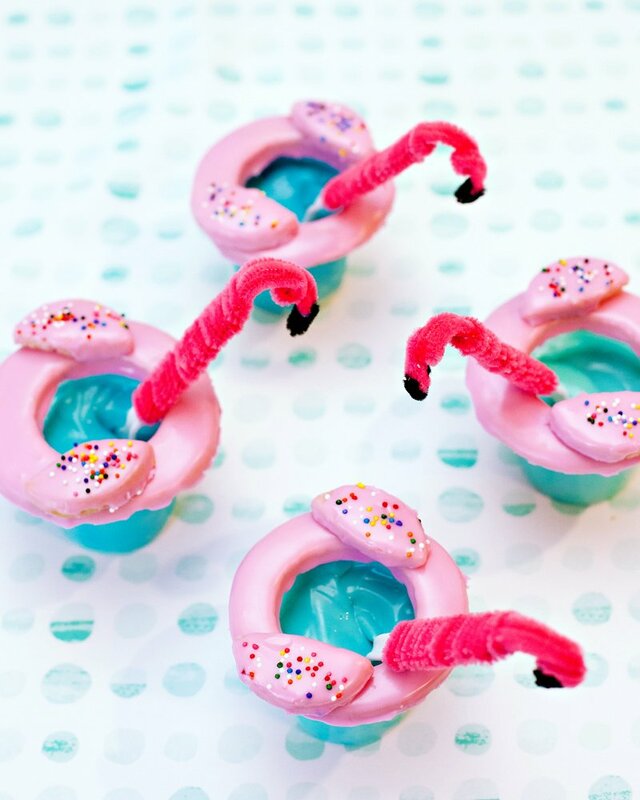 In love with this party! those cookies are fab! where did you get the stands for them?